U.S. President Barack Obama has proposed a funding boost forNASA that provides more support for Earth sciences missions and aviation, whilekeeping the agency?s three space shuttles on target for a 2010 retirement. NASA would receive $18.7 billion for the 2010 fiscal yearunder the budget proposal released by the White House on Thursday. That wouldbe an increase from the $17.2 billion NASA received in 2008 and represents anoverall boost of more than $2.4 billion for the space agency when coupled withthe additional $1 billion it received in the recenteconomic stimulus bill. The budget calls on NASA to complete International SpaceStation construction, as well as continue its Earth science missions and aviationresearch. Yet it also remains fixed to former President George W. Bush?s planto retirethe space shuttle fleet by 2010 and replace them with the new Orion CrewExploration Vehicle, which would fly astronauts to the space station and returnthem to the moon by 2020. The outline does make room for an extra shuttle flightbeyond the nine currently remaining on NASA?s schedule, but only if it isdeemed safe and can be flown before the end of 2010. "The$18.7 billion budget proposal for 2010 is fiscally responsible and reflects theadministration's desire for a robust and innovative agency aligned with the president'sgoals of advancing our nation's scientific, educational, economic and securityinterests,? said Acting NASA Administrator Chris Scolese in a statement. "Thisbudget ensures NASA maintains its global leadership in Earth and spaceresearch, and it advances global climate change studies, funds a robust programof human and robotic space exploration, allows us to realize the full potentialof the International Space Station, advances development of new spacetransportation systems, and renews our commitment to aeronautics." Provides $18.7 billion for NASA. Combined with the $1 billion provided to the agency in the American Recovery and Reinvestment Act of 2009, this represents a total increase of more than $2.4 billion over the 2008 level. Funds a program of space-based research that supports NASA?s commitment to deploy a global climate change research and monitoring system. Funds a robust program of space exploration involving humans and robots. NASA will return humans to the moon while also supporting a vigorous program of robotic exploration of the solar system and universe. 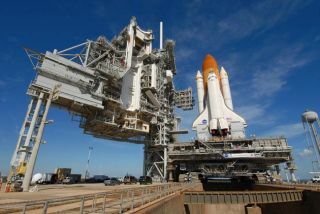 Funds the safe flight of the space shuttle through the vehicle?s retirement at the end of 2010. An additional flight will be conducted if it can be completed safely before the end of 2010. WhilePresident Obama?s budget outline does set aside more funding for NASA, somespace exploration supporters were disappointed in its lack of scope. "Thebudget proposal for NASA represents a disappointingly small step in the rightdirection. It is far from what is needed if the U.S. is to stimulate theeconomy, create more high-tech jobs and hold on to its eroding leadership positionin space," said Elliot Pulham, CEO of the Space Foundation, in a writtenstatement. "The proposed budget is a stay-the-course budget, not a budgetfor stimulus or change. Combined with the lingering absence of a NASAadministrator, we are missing a golden opportunity to lead and inspire at atime when leadership and inspiration are crucial."